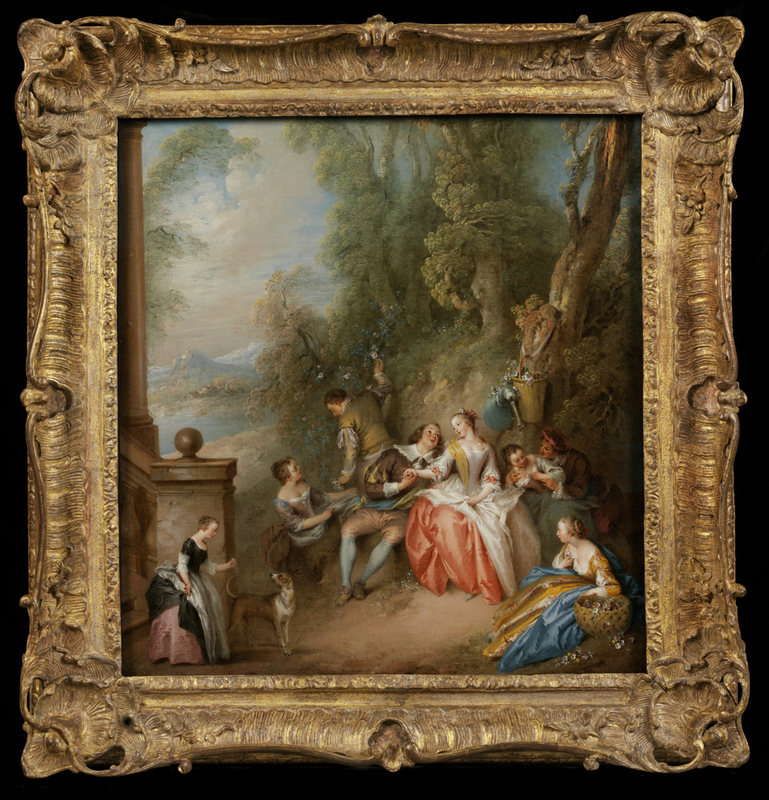 The V & A’s new Europe 1600-1815 Galleries include 50 framed paintings on display, which have been carefully selected to contribute to the themes and stories told in each of the galleries. The frames surrounding these paintings are not in themselves didactic, but when considered in more detail several have an interesting tale to tell of their own and deserve a closer look. In this article I will describe how and why some paintings were reframed for display in the new galleries, providing an interesting insight into the aesthetic impact different frames have on a painting. I will also look at some of the frames in more detail and show how they are outstanding examples of craftsmanship and should be considered as objects in their own right. 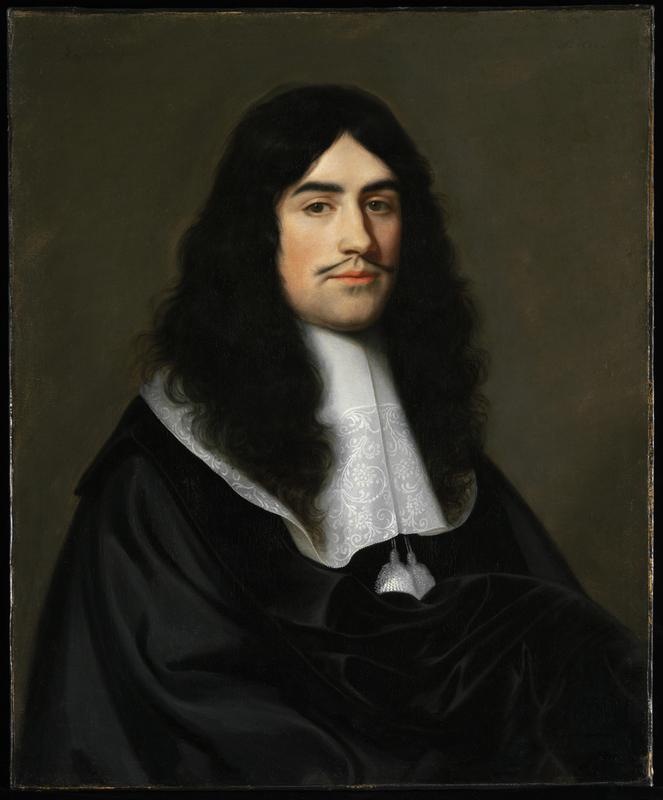 This portrait, attributed to Bartolomeus van der Helst, was acquired by the V & A in 1990, framed in a modern plain moulded gilded strip frame. There was no documentation regarding its original frame. The modern frame was not appropriate for its display either in terms of aesthetics or practically, as, being so thin, it was inadequate to house glazing (all V & A paintings are glazed as standard for display). Other examples of 17th century Dutch portraiture were looked to for inspiration in making a new chronologically-appropriate frame. 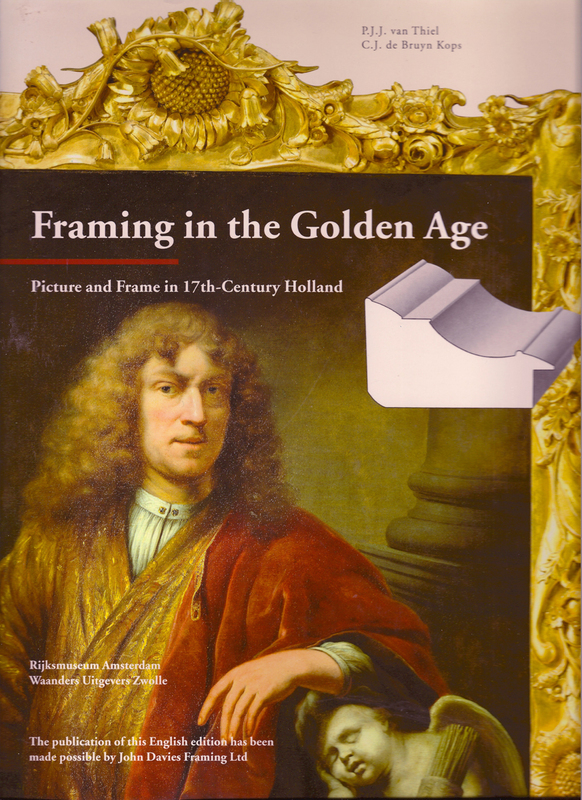 The pioneering exhibition catalogue and book, Prijst de lijst by Pieter J. J. van Thiel and C. J. de Bruyn Kops (Rijksmusem, 1984), translated into English as Framing in the Golden Age: Picture and Frame in 17th-century Holland, 1995, was used as the main source. The book presents many Dutch portraits in their original frames and contains high quality illustrations and detailed cross sections. From these, a selection was made of profiles for plain black ebonized Dutch 17th century scotia frames. These were adapted to create the following profile for a new frame which was made in the Furniture Conservation studio. This landscape in the style of Adriaen van de Velde was acquired by the V & A in 1869, and again there is no documentation about its framing history. At some point after its acquisition it was framed in a ‘V & A travelling frame’; these were made in the Museum in the 19th century to transport paintings going on loan. They are plain oak mouldings, stained and polished, with a strip of gilded composition ornament. In the context of the new Europe Galleries, it was decided to replace this frame. The V & A has a small collection of frames which were acquired without paintings as objects in their own right, so we looked through these to see if any were suitable in terms of style and size. Fortunately there was a Dutch 17th century architrave frame with almost the same dimensions. Although it was damaged and missing some of its decoration, the craftsmanship of the frame was of a very high standard, with intricate ebony ripple mouldings at the top and sight edges, and a frieze veneered with turtle shell, inlaid with ivory or bone. The turtle shell veneer has been painted red underneath, emphasizing its translucency and natural pattern. 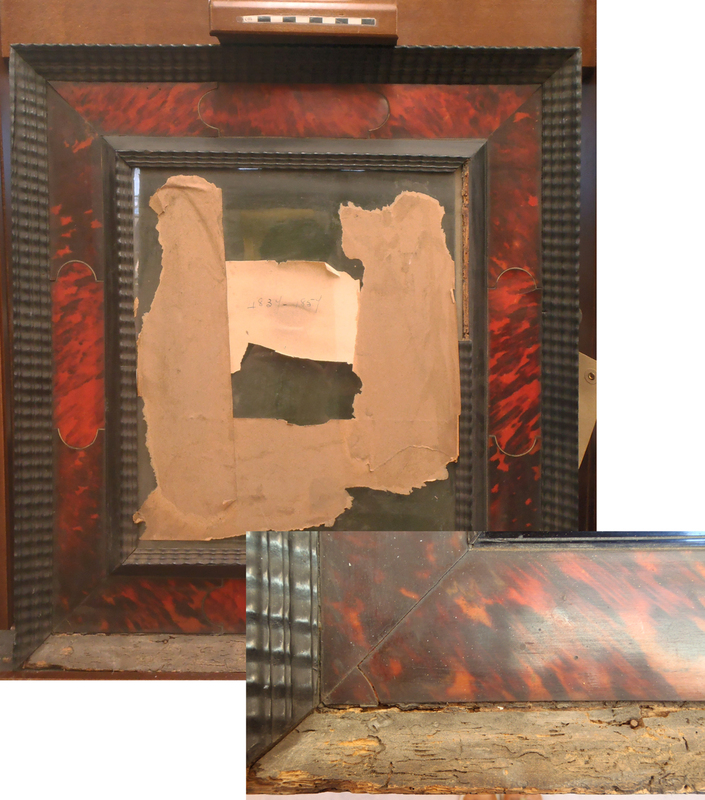 These types of frames were very expensive and generally used on paintings of smaller sizes. The lost ornament was replaced and the frame was cleaned. Whereas the frame fitted perfectly in height it was one and a half centimetres too wide on either side, so an inner sub-frame was fabricated to make up for the difference in size. 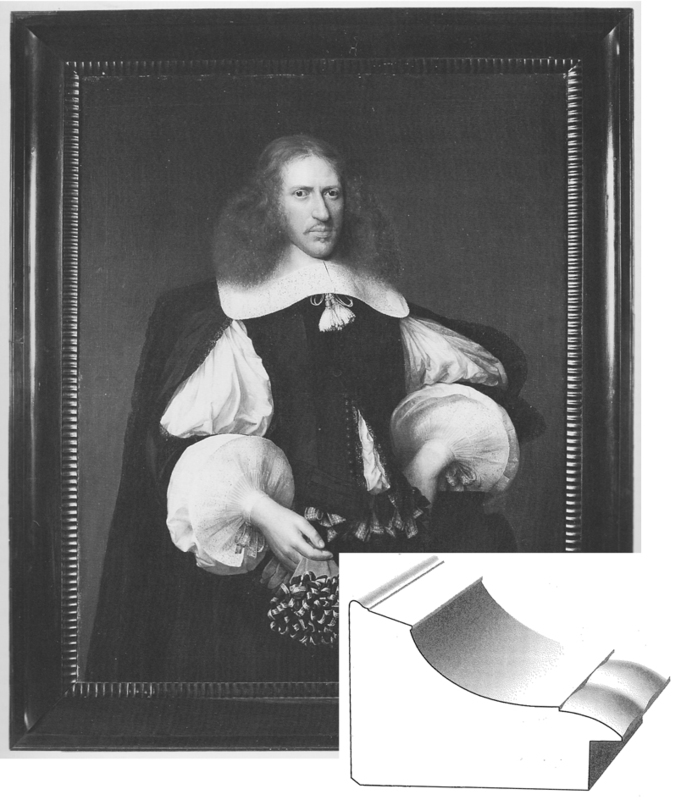 A system was devised to fix the painting in the frame without having to create any new screw holes in the original frame. 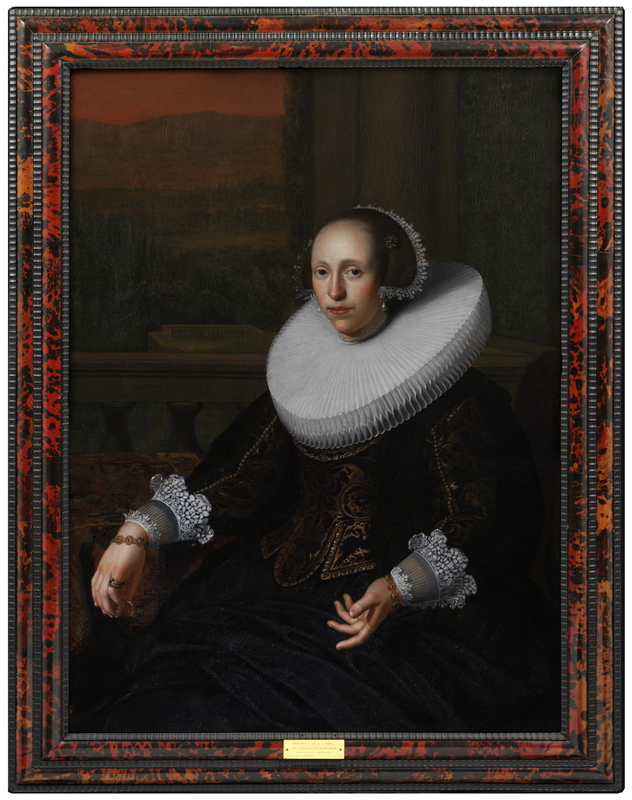 There is a similar frame in Gallery 6 surrounding the Portrait of an unknown lady in a ruff, c.1630-1635. 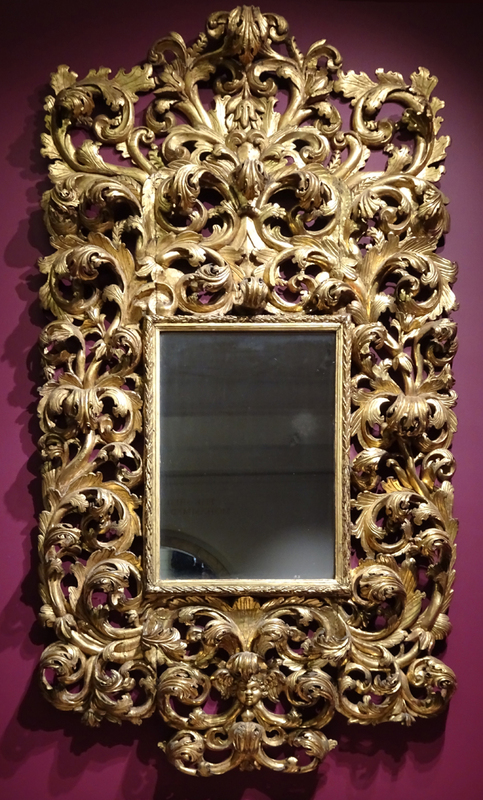 ; (bottom) copy of Flemish late 16th century-style frame, parcel gilt hand-run oak. 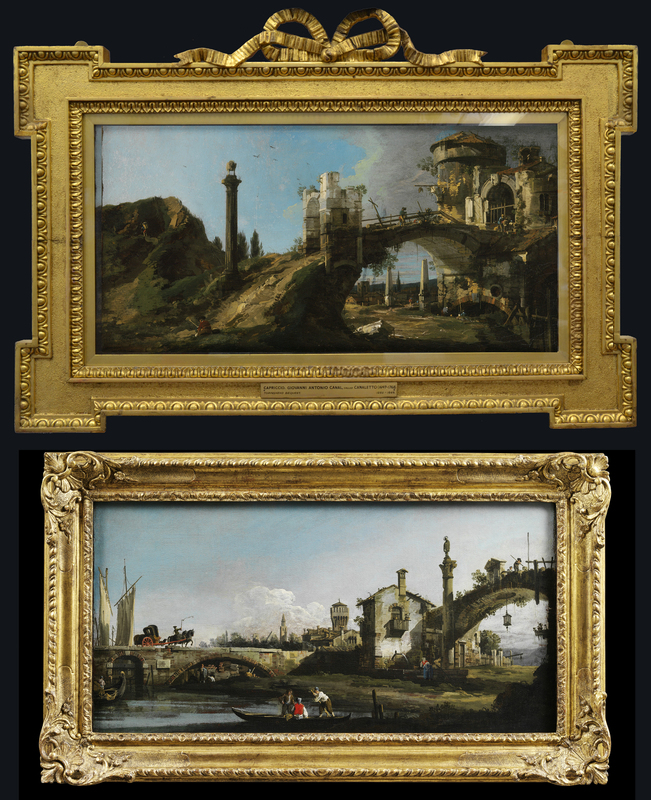 Like the Van de Velde-style landscape, the paintings above and below were also mounted in a ‘V & A travel frames’, so more appropriate settings were acquired for their display. 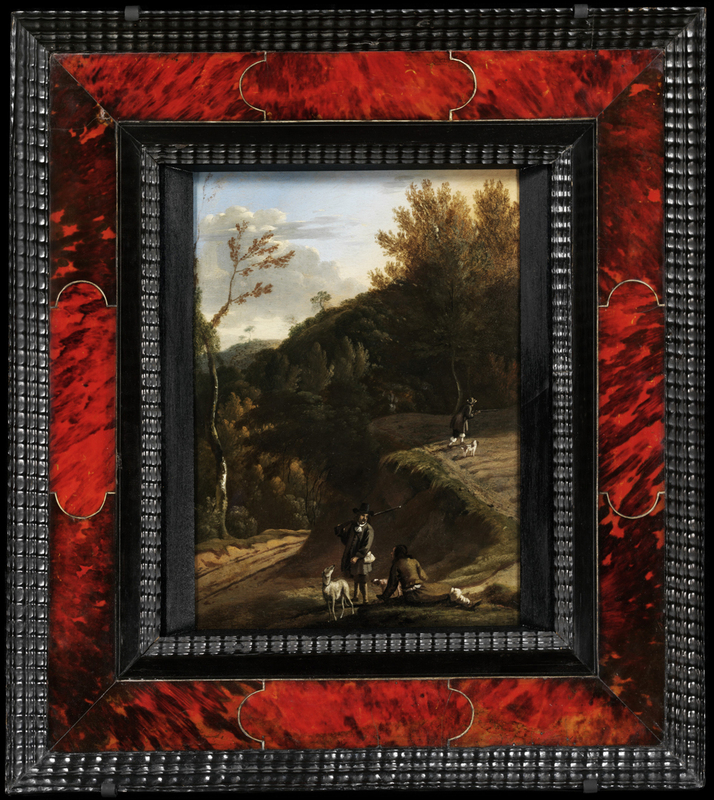 The Landscape with hawking party (circle of Wouverman) had been displayed in a ‘V & A travel frame’ which at some point had been painted white. 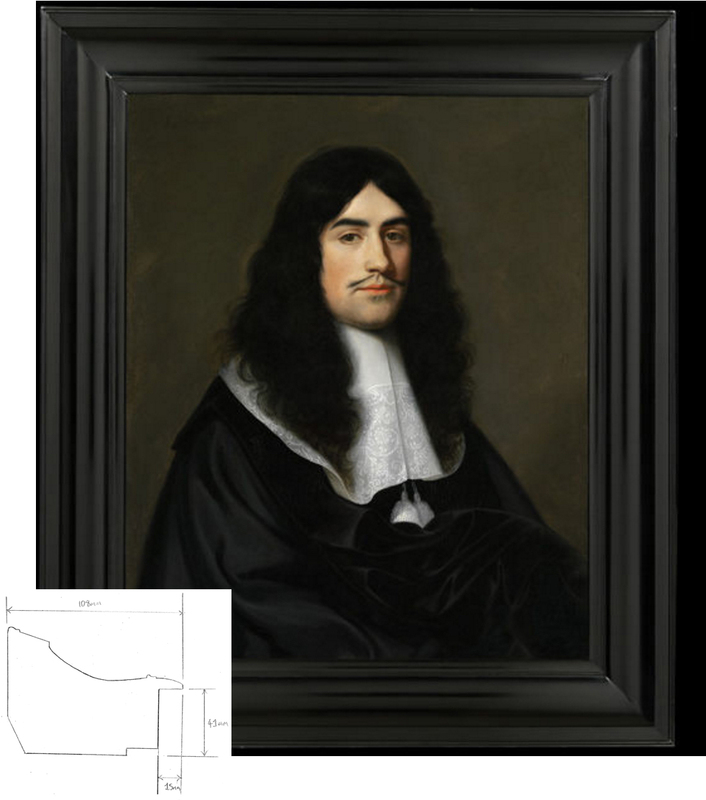 As the Museum possessed no suitable model to copy, an historic original Dutch Louis XIV carved & gilded frame was purchased. The paintings (above) by Canaletto were both acquired in 1869. At some point after their acquisition, one was framed in an elaborate ‘Kent’-style frame (with an inlay to bridge the difference in size), whilst the other was framed in a more sympathetic Louis XIV-style carved & gilded frame. There are no records as to when or why these frames were chosen. For the redisplay in the Europe 1600-1815 Galleries it was decided to have the more appropriate French frame copied. A framemaker was commissioned to copy the frame in carved in wood and gild it to match the existing finish. 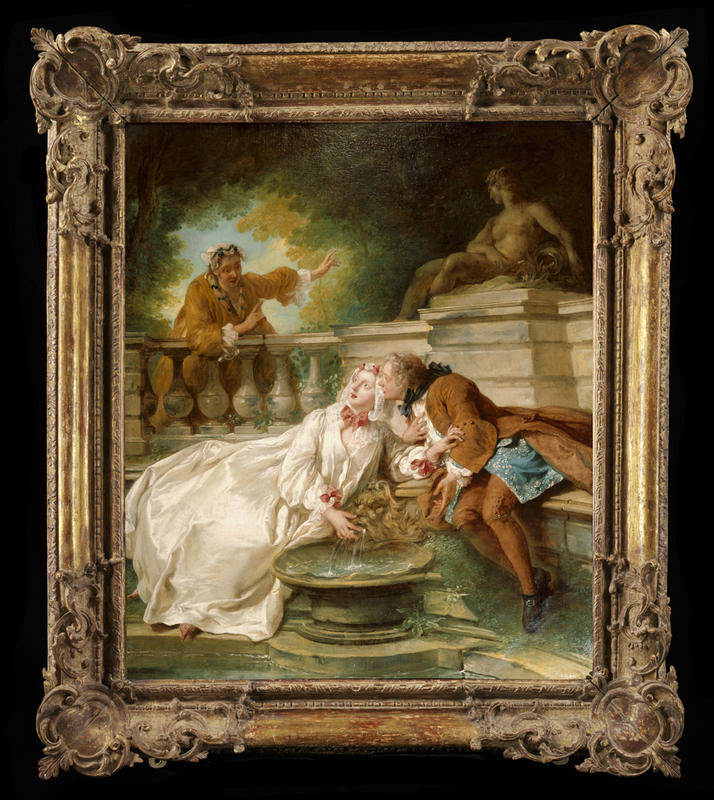 The following examples are of two paintings which are thought to be still in their original frames; a closer look at the ornament shows the extremely high level of craftsmanship attained in France in the 18th century. The 17th and 18th centuries were the grandest epoch in France for the art of gilding on wood, and the more luxurious picture frames were carved by maître sculpteurs. The processes involved were highly skilled: a wooden carcass was produced by the menuisier, or joiner; the ornament was carved by the sculpteur, the gesso was applied and re-cut by the repareur, and finally the gilding was applied by the doreur. The materials and techniques of 18th century French gilding are noted in several treatises; Jean-Felix Watin describes up to 20 steps in his 1772 work, L’Art du peintre, doreur, vernisseur. Several layers of liquid gesso are applied over the carved wood, and when these have dried and been polished smooth, fine details are cut into the surface. In this way the carving of the wooden ornament is redefined, and further details are added to emphasize the ‘rhythm of the ornament’ (veins of leaves and petals, for example, may be added at this stage). The recutting is known as reparure and was highly-skilled work; its cost could amount to more than one third of the total. 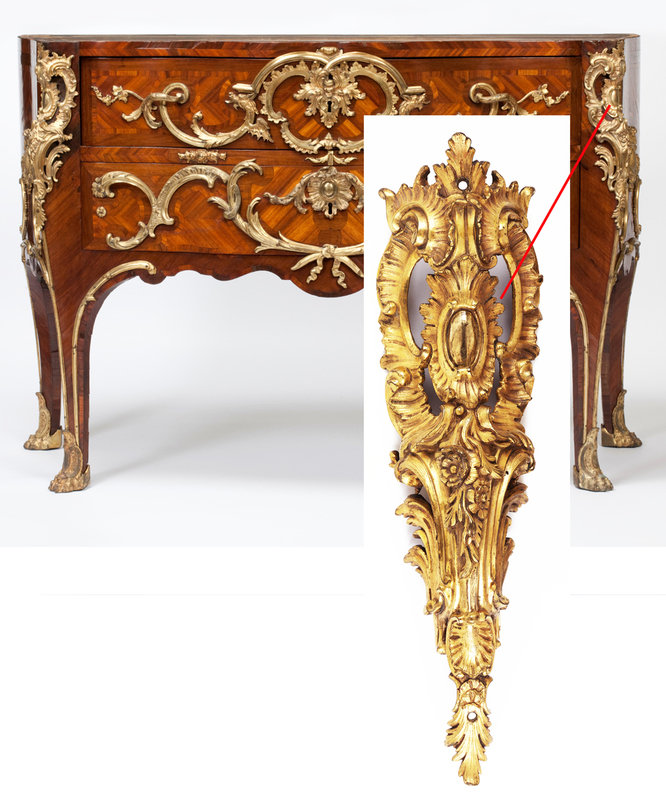 This technique characterizes French gilding, and each period can be defined by its different styles of reparure. The reparure on the two frames (above & below) is very fine, and details such as the veining in the leaves and fluting have all been cut by hand. 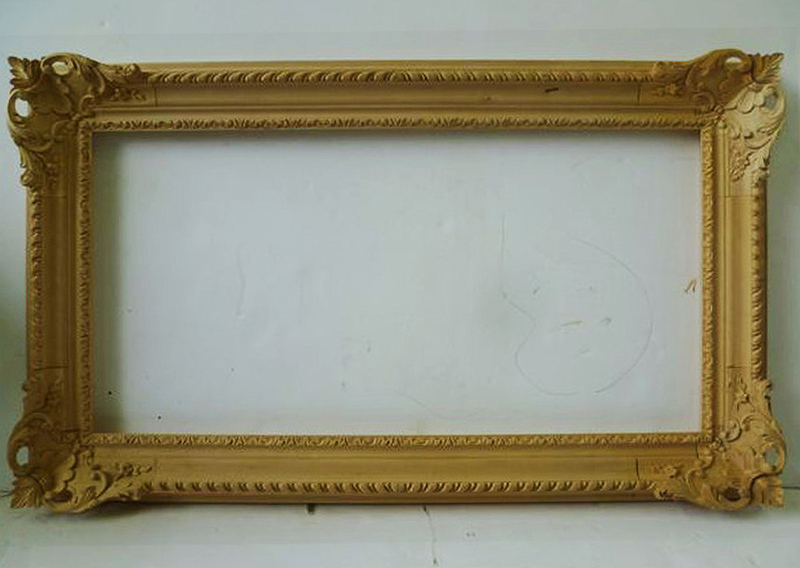 These two frames have, at some point, been stripped to the remains of the original gilding; much of this original gold leaf is worn, revealing a dark red bole below – also typical of French gilding from this period. 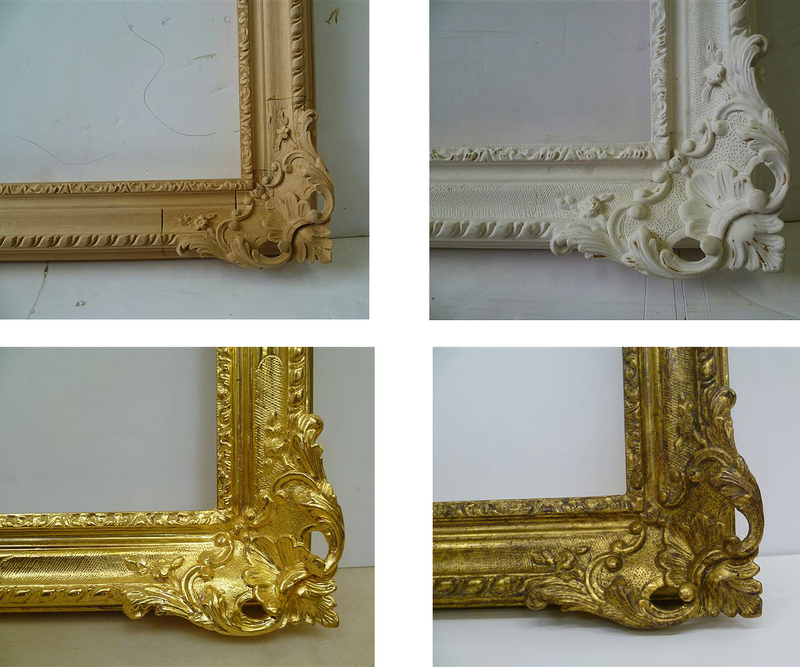 Originally the appearance of the frames would have been much more like solid gold, and there would have been areas of burnish and matt to give play to the light, and enhance the patterns carved into the gesso. The finish would have mirrored the finely chased work and the matt & burnished surfaces found in the gilt bronze metal mounts of contemporary furniture. Since their creation picture frames have tended to lead a rather hazardous existence as they have changed ownership over the years. This, or an alteration in fashion, often meant that the frame too was replaced. Even within museums picture frames have been swapped, changed or replaced to suit different presentation and display trends. Today there is a move towards authenticity, and current displays strive to re-instate, where possible, paintings in their original settings; or, where there is not enough information on the original frame, an approximation of how they would have appeared. In this way the choices made recognize and pay tribute to the craftsmanship involved in what is an often under-appreciated decorative art form. Zoë Allen is Senior Gilded Furniture & Frames Conservator at the V & A, and co-author with Christine Powell of Italian Renaissance frames at the V & A: a technical study, 2009. 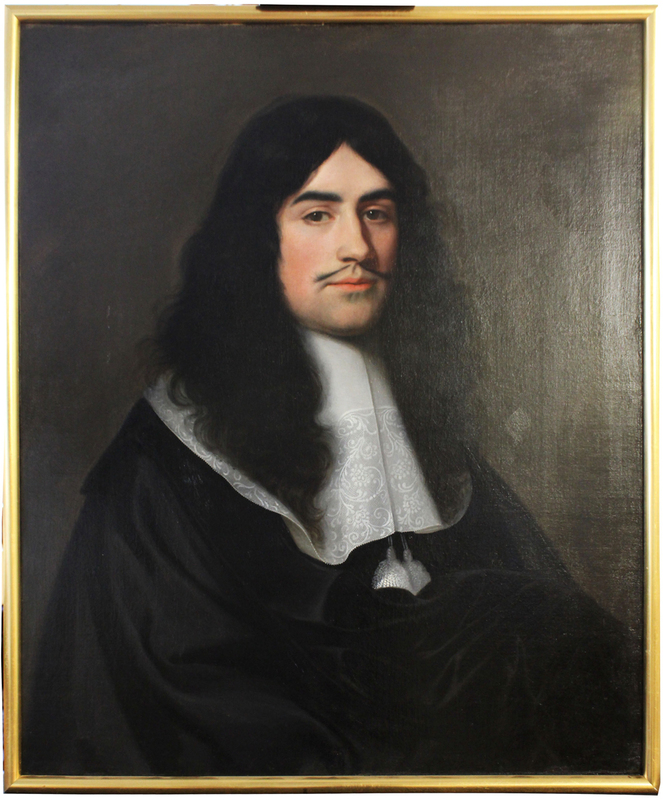 Acknowledgements: with thanks to Andrew Thackray, who made the frame for Bartolomeus van der Helst (attrib. 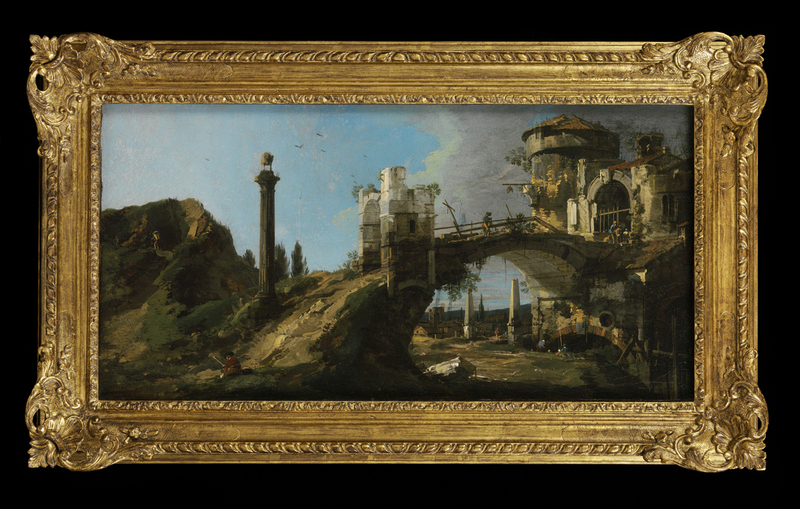 ), Portrait of a Man, Museum No: E.330-1990; Tom Proctor, who made the frame for Canaletto’s Ruined bridges with figures, Museum No. 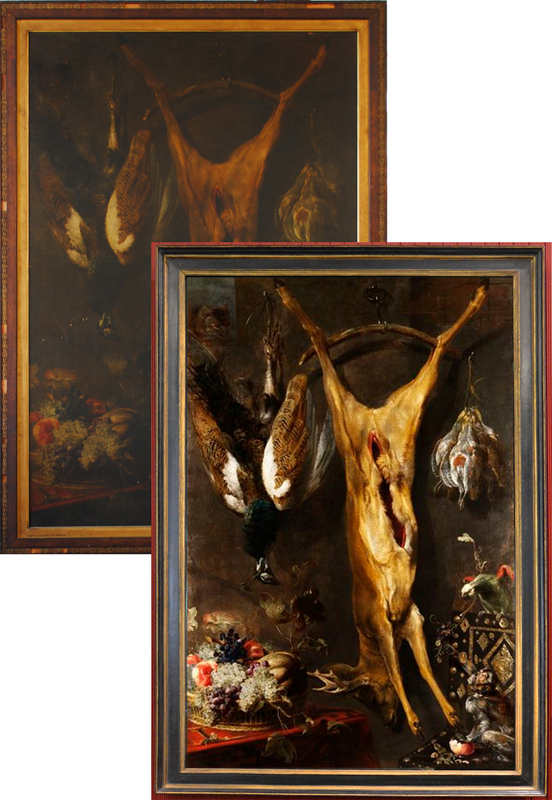 1352-1869; and Rollo Whately, who provided the frames for Frans Snyders, Still life with a dead stag, Museum Number 4418-1857, & Wouverman (circle of), Landscape with hawking party, Museum Number: 542-1870. We do not go to the V & A – in general – to look at picture frames. It is true that the Museum possesses a collection of empty frames (as noted above; see, also as noted, Italian Renaissance frames at the V & A: a technical study; and see Renaissance symbols), but these are not often displayed in the galleries, and exist as a sort of study collection, as well as a framing wardrobe for naked paintings entering the collection. 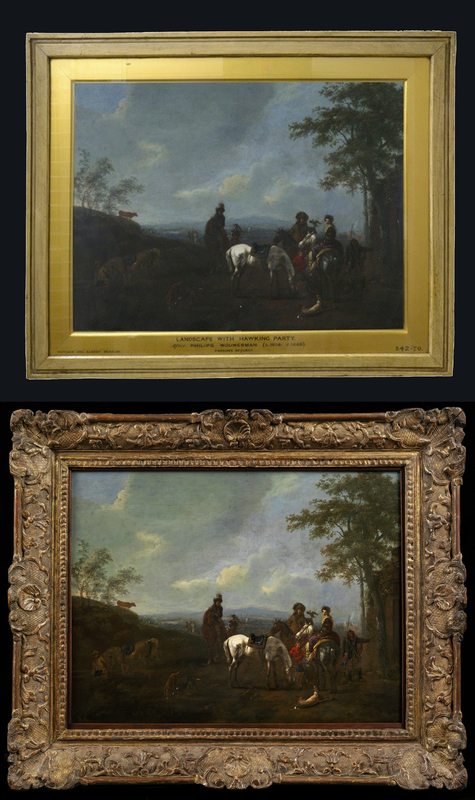 There are some exceptional frames still on their original paintings – for example, the Paul Petit Rococo trophy frame on George Knapton’s portrait, George III when Prince of Wales (c.1755), and the early 15th century Altarpiece of St George from Valencia – but, as a general rule, the Museum’s frames and their putative contents exist in different departments. 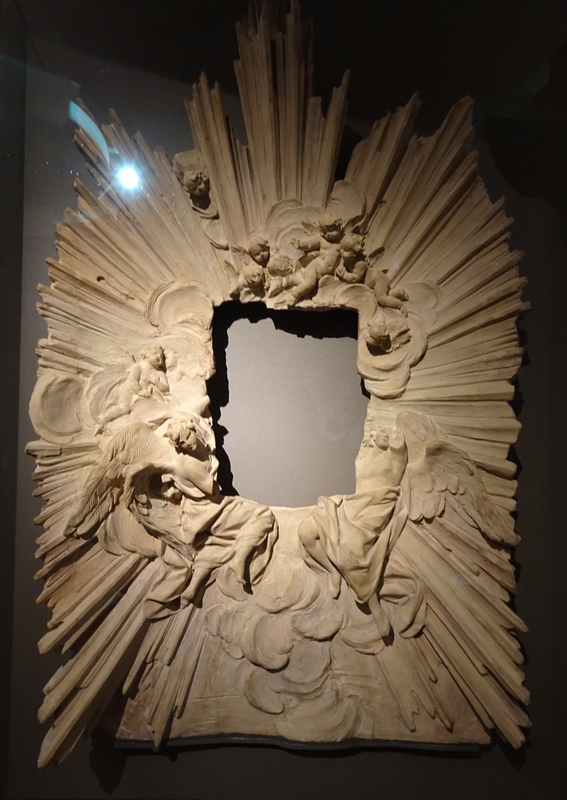 If you visit the newly-refurbished Baroque galleries, however, you will see a good many frames – not, in the main (apart from those described in the article above), removable picture frames, but modellos, window frames, cartouches, altarpieces, frames for pietre dure panels or bronzes, integral ‘frames’ in pieces of furniture, and looking-glass frames, all of which are, of course, intimately linked to the removable, portable, carved wooden borders of paintings, and to the interiors in which they hang. The first room of the Europe: 1600-1815 galleries makes the point in three examples. 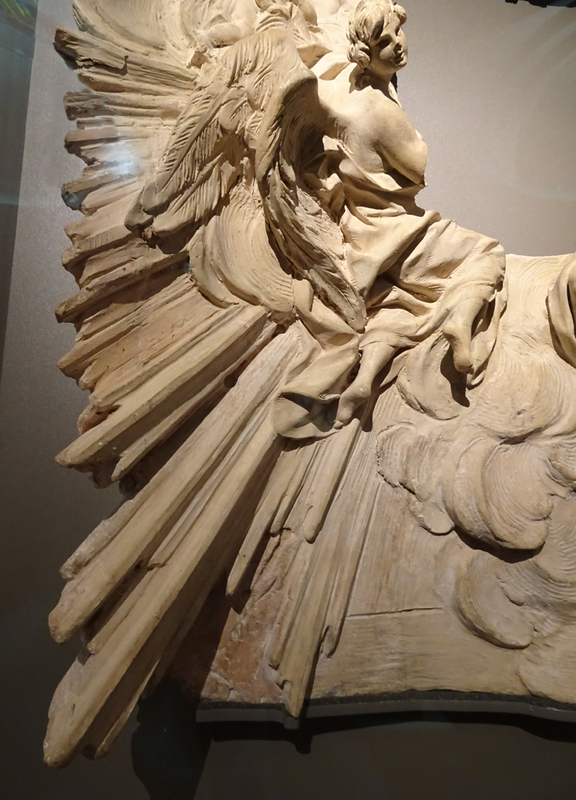 Here is the modello for an altarpiece by Ercole Ferrata, or his circle, made of terracotta in 1660-80; it takes the form of a glory, or sunburst, surrounding a space which might once have been oval rather than roughly oblong, as evidenced by the loss of arms in the adult angels, and in the cut cloud, top right. It could have been designed to hold a painting (Christ on the Cross, the Ascension, the Assumption), or a relic at the centre of a gilded glory, continuing the outer frame. It realizes all the main attributes of the Baroque – theatricality, modelling through light and shade, and the use (in a frame) of natural, rather than architectural, ornament. If the sun can be described as a natural ornament, then this is an innately Baroque frame; it takes the sun-ray motif, used slightly earlier by Bernini (for example) in the Chair of St Peter (1647-53, St Peter’s Basilica, Rome), or the Ecstasy of St Theresa (1652, Santa Maria della Vittoria, Rome), and – rather than adding the motif to a conventional framing structure – turns it, itself, into a fully-developed picture frame. Even in its small embryonic incarnation in the V & A, the drama of this piece is explicit, as is the realization that Baroque artists and architects seem to have had almost before our eyes, that the use of ‘naturalistic’ rays in a sunburst like this one might act, even more powerfully than architectural decorative elements such as flutes or knulls, to seize and direct the spectator’s eye to the art held in the centre. This effect is aided by the emphatic asymmetry of the rays of the glory, and of the angels and cherubs; this is a disruptive asymmetry, designed to jolt the worshipper awake – to rouse and disturb, rather than to soothe. It is underscored, in the Museum, by its hanging at eye-level (emulating the way it would be seen in a church), and the way it is lit, which emphasizes the spear-like force of the rays, and their crystalline forms. Nearby is a work at the opposite extreme; symmetrical, balanced, static, and devoid of any dramatic emotion, one of a set of pietre dure wall-panels made by the Galleria dei lavori (Grand Ducal workshops) of the Medici for a domestic oratory. It is at once completely flat and decorative, like a carpet, textile or ornamental motif, and a picture with exaggerated perspectival recession set within an outer panelled frame. The colouring and ornaments of the latter reproduce what would have been carved or painted on a picture frame – even to the grotesque cartouches in the corners. 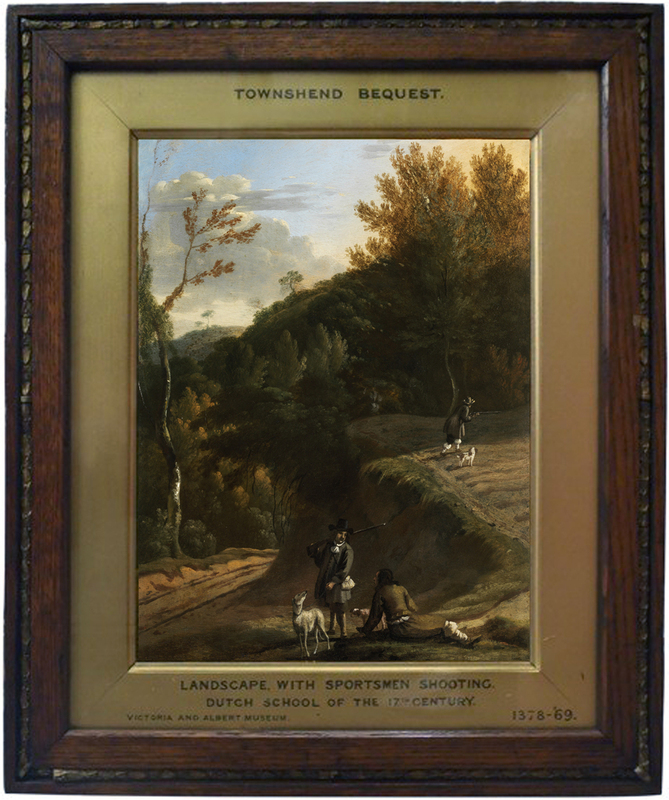 The dark ground of the border and the use of lines of pale golden marble enhance this effect of a framed painting, which might have been set in an interior in juxtaposition with carved and gilded Baroque wooden frames, each providing a foil for the other. 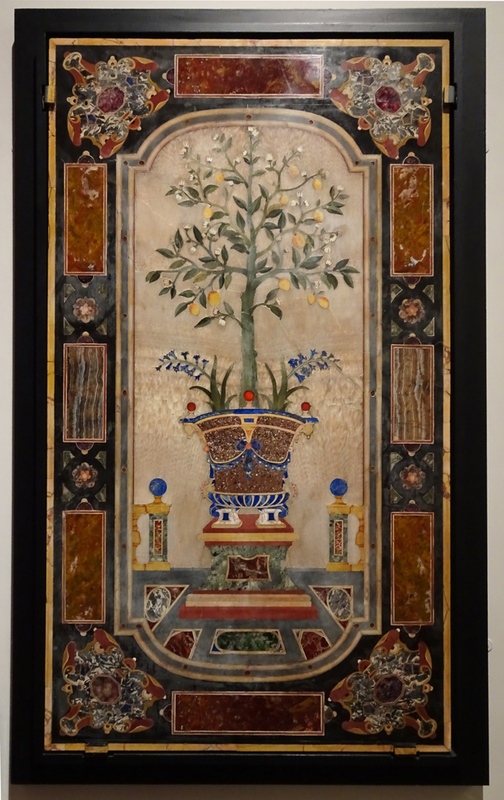 The art of pietre dure had been rediscovered during the Renaissance, when Roman originals were found and copied; under the sway of Mannerism they were produced with the intense colours of Mannerist paintings, and with motifs such as leatherwork scrolls. The remnants of this style are discernible in these wall-panels, with the added tension derived from the Baroque opposition of a flat decorative surface and a violently receding space. The third important frame in this entrance gallery is the staggeringly huge and intricately scrolling foliate frame which faces the entrance: over nine feet high, a wilderness of undercut, pierced and twiningly sculptural acanthus stems, which roil and twist and sprout from lily-like junctions, this has a disproportionately high crest, and an apron in which a small disconsolate cherub’s head lurks sullenly under an umbrella-like leaf. This is the essence of Baroque carved giltwood ornament – a flat border which becomes three-dimensional, full of dramatic movement, and exploits the effects of light on gold leaf to reinforce both attributes. This is a design intended to capture as much light as possible within a large palace chamber, and throw it back into the room; it is also intended to hold its own in the horror vacui of coloured marbles, polychromy and brocaded velvets of a Baroque palazzo. It would often be married with a gilded table below it, of similarly riotous ornament (as indeed it is here, in the V & A). There were also, of course, picture frames related to this style, but never quite on the scale or complexity of the looking-glass frames, since their intention was to capture the spectator’s attention without overwhelming the objects they were designed to display. 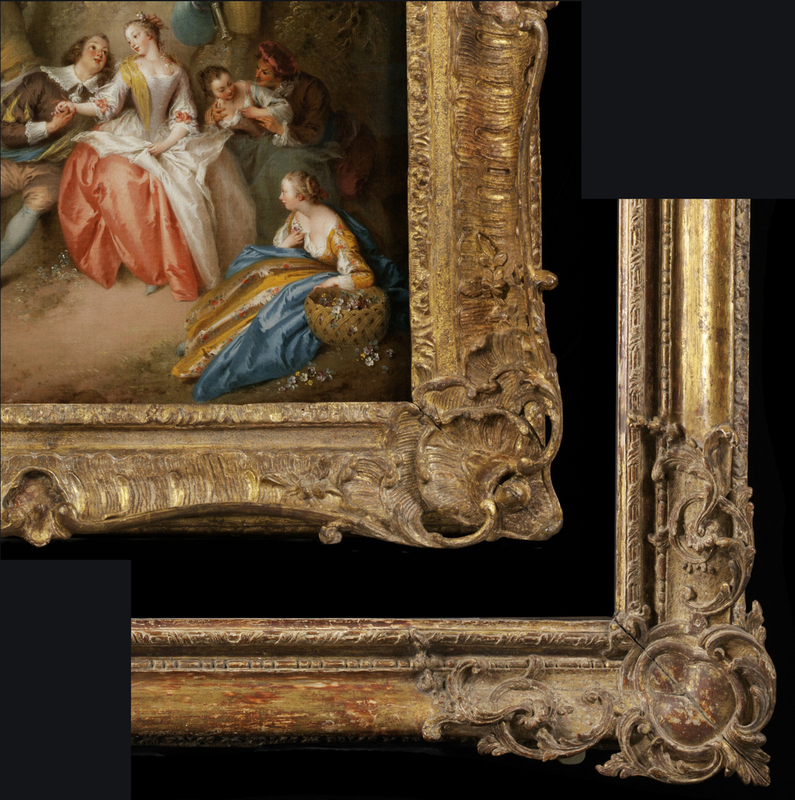 Moving on within the Baroque galleries, the next frame of note is an altarpiece frame – yet one of the most intricate and eccentric form. This is a four foot tall tower, completely veneered in amber, with translucent amber columns, and carved ivory plaques and details. It is a miniaturized version of the grand architectural high altar which would normally be the centrepiece of a church interior. The unknown artist has employed the various shades and differences in opacity of what was then considered a mystic substance to highlight different elements of the work; this includes the patterned ‘floors’ of the various tiers, and the central pictorial plaque, with the Adoration of the Shepherds. It includes all the tropes and devices of a full-scale altarpiece, with the advancing and retreating levels of the façade, the shaped pediment, the columns, plinths and finials, the predella with brackets and saints, and the cherubs and angels which garnish it like cherries. It is beautifully displayed in a vitrine, so that it can be examined quite closely, and is also well-lit. The upper tiers include various sub-frames, from the oval with the Crucifixion at the crest, through the three shaped plaques below with their pierced ivory spandrels, and the tiny ivory frame hung from ribbons, with swags of fruit. As well as scenes from the New and Old Testament, the reverse of the work includes a perpetual calendar, and zodiacal signs, and looks more like a scaled-down cabinet than an altarpiece. 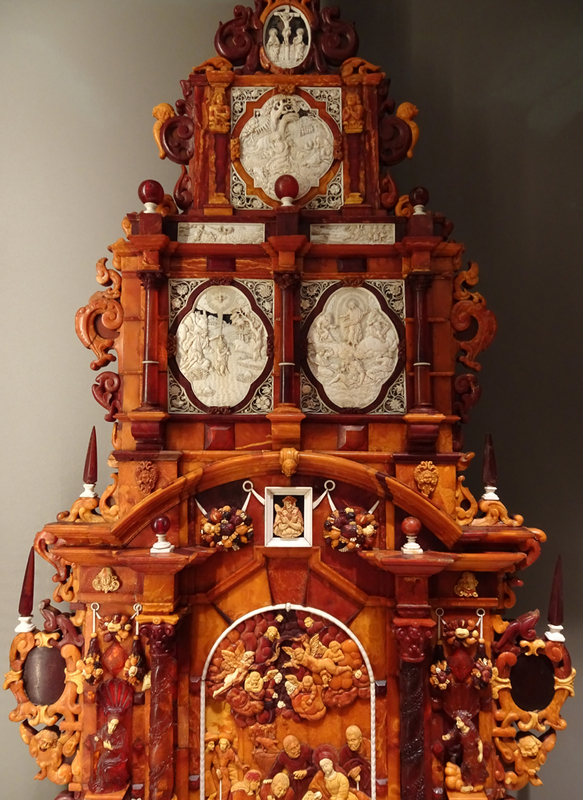 Beyond this extraordinary kunstkammer masterwork, two actual cabinets are displayed, which have equally intimate connections with the picture frame. The first is the Endymion Cabinet, made of oak, pine, cedar and mahogany, but veneered overall in ebony, with a spectacular marquetry interior (alas, not visible to the general visitor). 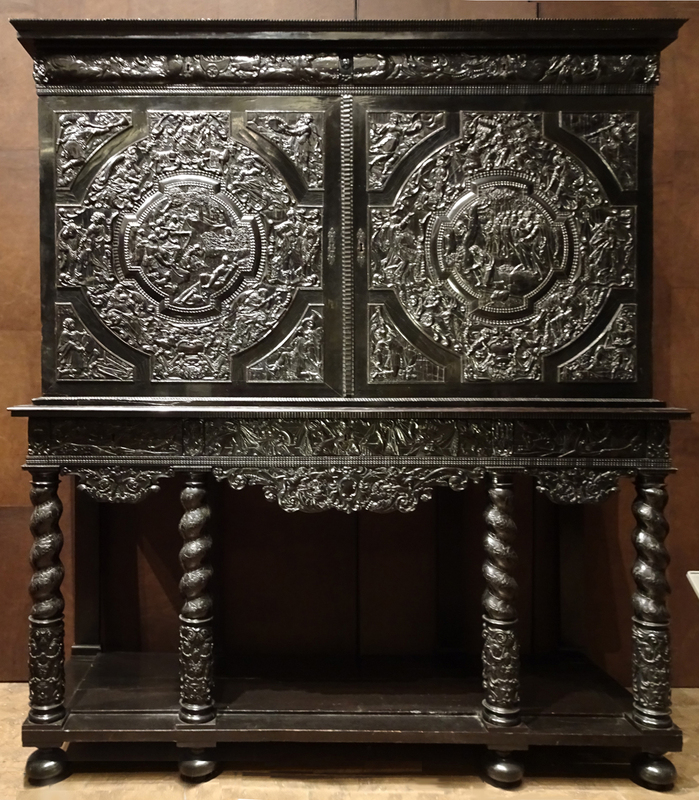 It dates from 1630-50, and might be thought of as a specifically Netherlandish work, although the use of ripple mouldings in ebony, and indeed of cabinets like these and related picture frames, originate in Germany. This, however, is a Parisian piece, where such cabinets enjoyed a period of great fashionability, and where they were known as cabinets d’Allemagne. The carved ebony reliefs illustrate the story of Endymion from a French novel, published in 1624; they include – as well as the broken roundels on the front – octagonal panels on the insides of the doors, which are closely linked, in their use of ripple moulded borders, interrupted wave mouldings and plain friezes, to ebony and ebonized picture frames. The stand may also be considered in the light of a (picture) frame, with its figural entablature and Salomonic columns. The caption to this piece (the captions are in general large and at the same time perhaps somewhat parsimonious with information) is in this instance apposite, quoting from the 17th century French sailor, Francis Cauche, in his A voyage to Madagascar…, on the virtues of ebony – a luxurious staple of the Baroque age, along with gold, silver, pietre dure, tortoiseshell, ivory and amber. 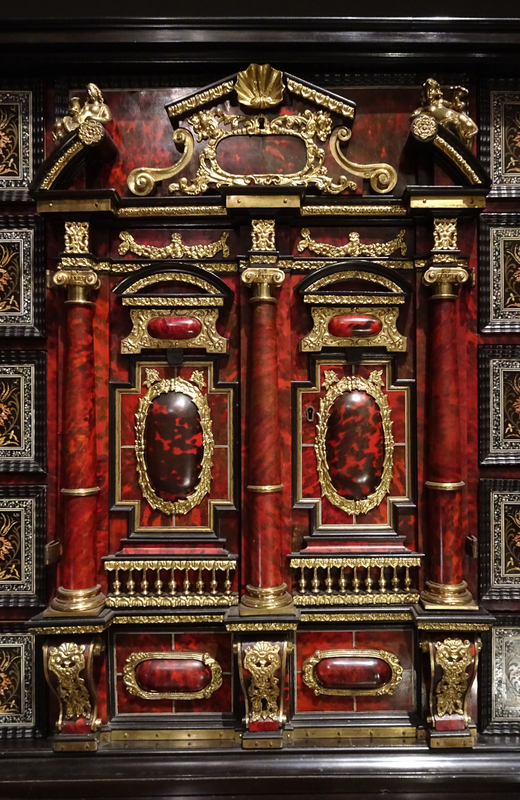 The second cabinet is Flemish, slightly later (mid-17th century) and includes even more of those luxury materials, being veneered with tortoiseshell on a coloured vermilion parchment base, as well as ebony, ivory and mother-o’-pearl. Its central panel is designed like a Baroque altarpiece, with an open pediment, columns supporting an entablature, and predella panel with large modillions, or brackets. It has much in common with the amber altarpiece, and also with the pietre dure wall-panels (above), in the floral fronts of the drawers, which are made of composition inlaid with mother-o’-pearl, polished to look like lacquer. 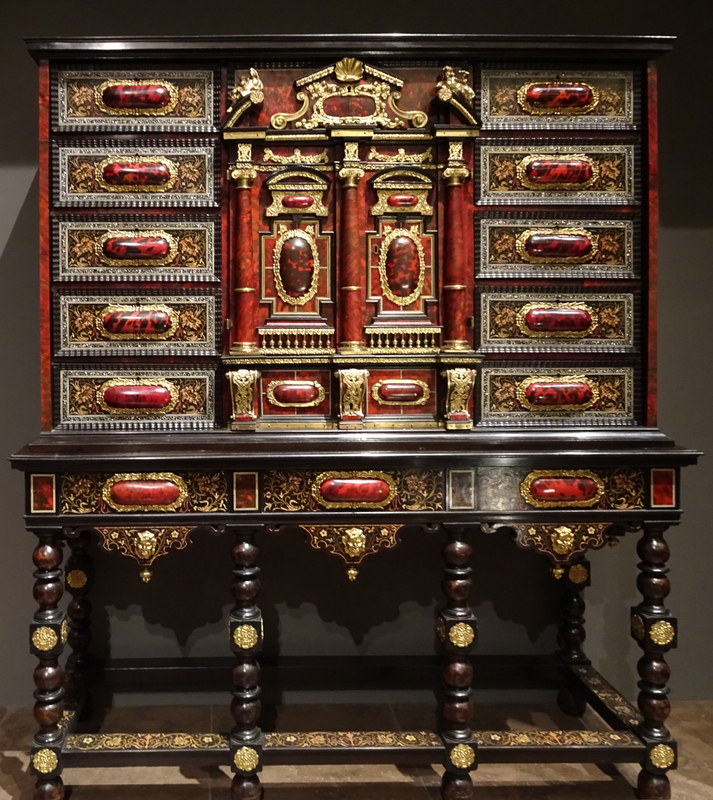 Such a cabinet would have most probably been used for storing small precious items, such as coins, cameos and medals, in the bank of drawers behind the doors; in this way it is like a secular form of reliquary, as expressed by analogy in the Baroque aedicule of its façade. 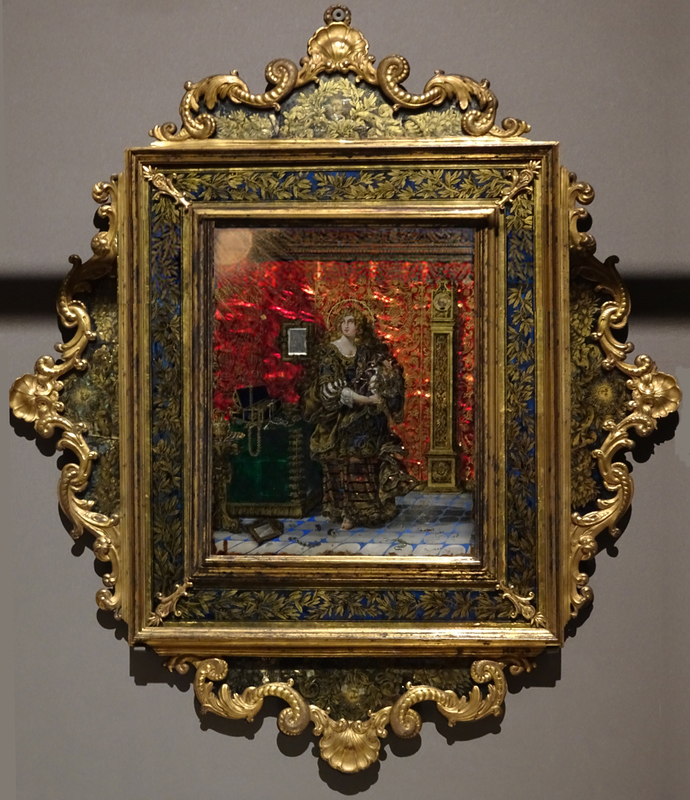 A more conventional type of frame holds a glass panel of the penitent Magdalen, etched, gilded and lacquered on the reverse, and set into a gilt bronze cassetta, also decorated with gilding and verre églomisé. Probably of French workmanship, possibly using a mistress of Louis XIV as a model for the Magdalen, this domestic devotional image rather undermines its sacred function, in that the sunburst in the top left corner may also allude to the Sun King rather than to Christ. This is another instance, like the pietre dure wall-panel, above, where the sense that this is a Baroque work resides in the use of rich colouring and flat pattern, rather than in a three-dimensional sculptural object which plays with modelling through light and shade. It is also Baroque in its use of unusual materials allied to extravagant natural motifs; so the simple cassetta form is remade in ormolu, with a scrolling crest repeated at each side; whilst the frieze is set with glass, rather than being punched, carved, or decorated with sgraffito, and the gilded bay-leaves enriching it are extravagantly realistic and asymmetric. Like most of the exhibits, it is lit dramatically to bring out the glow of the foil-backed colours; unfortunately a bar of shadow rather undercuts the impact of this presentation. A frame with a rather more Baroque profile is used for the high-relief sculpture of the Virgin and Child after Alessandro Algardi (from the altarpiece he sculpted for San Nicola da Tolentino). Here is another sunburst, and another use of ormolu, in the image itself. The marble backing is a replacement, but the frame is original, although perhaps slightly later than the relief; it combines ebony and gilt bronze in a particularly rich and plastic interpretation of that characteristic 17th century frame – the Roman ‘Salvator Rosa’. This is such a versatile pattern: used in its very plain, unornamented wooden version as a gallery frame in Roman palazzo, it created the perfect foil for a close hang of paintings from different periods and countries, but here it provides the most opulent and precious setting for another domestic devotional image. This comes from the family home of Benedict XIV (Pope from 1740-58), the Palazzo Lambertini in Bologna. The deep profile, with a high convex top edge above a scotia or hollow, is exaggerated by the gilt bronze ovolo decoration added to it; these projected and stepped-back mouldings, with their highlighted surfaces and cast shadows, echo the façades of Baroque buildings, and the strong contrasts of light and shade used to model them and confer a sense of drama and movement. The group of the Madonna and Child is modelled almost in the round and is startlingly three-dimensional against the flat sunburst, but the depth of the frame helps to concentrate light onto it, and isolates it on the wall within an eye-catching nimbus. 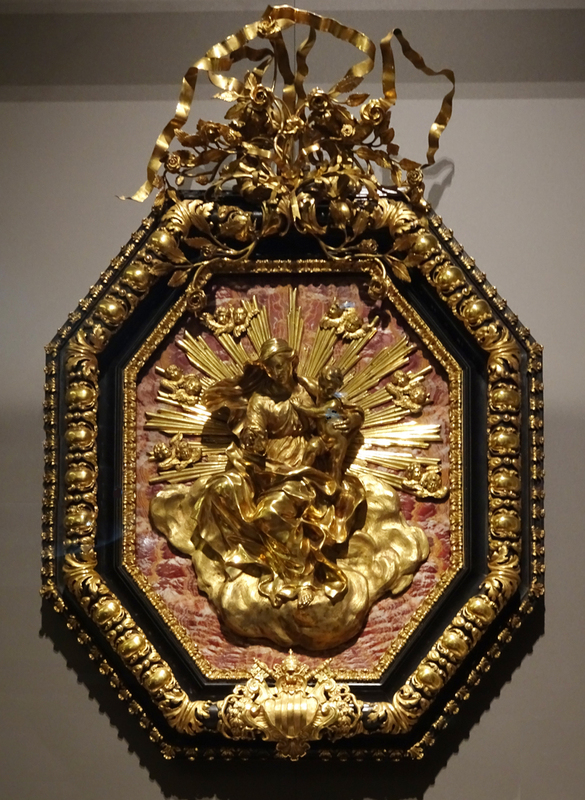 This is also a trophy frame; at the bottom it carries the coat of arms of Benedict XIV, whilst the crest is a wildly tangled bouquet of ribbons and roses – the flower of the Madonna. Another trophy frame in this display demonstrates how expansive the idea of the frame can be; the carved wooden setting – which we might think is the main or only type of a true picture frame – can appear in wonderfully different guises and materials; especially, it seems, in the Baroque period. 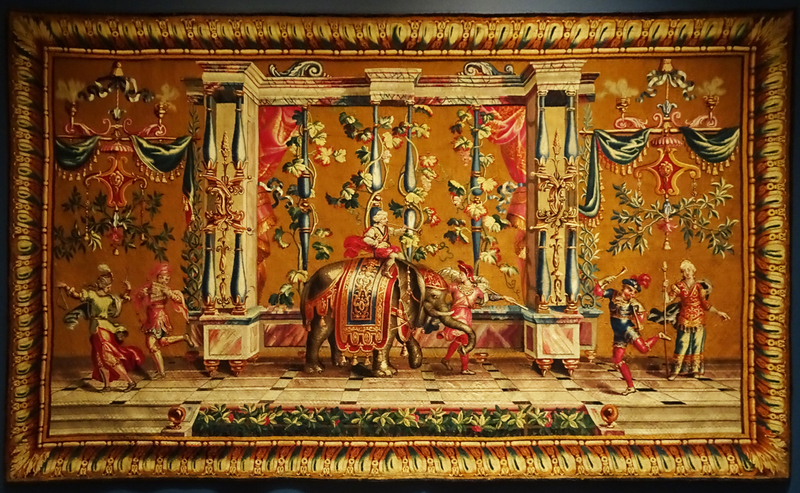 As well as terra cotta, pietre dure, amber, ebony, ormolu and verre églomisé, frames were also made in wools and silks. Tapestries are traditionally good references for contemporary picture frames, their shapes and ornaments, since many tapestries were woven with integral borders which either replicate wooden frames, or translate them into ‘real’ equivalents of motifs which they use. 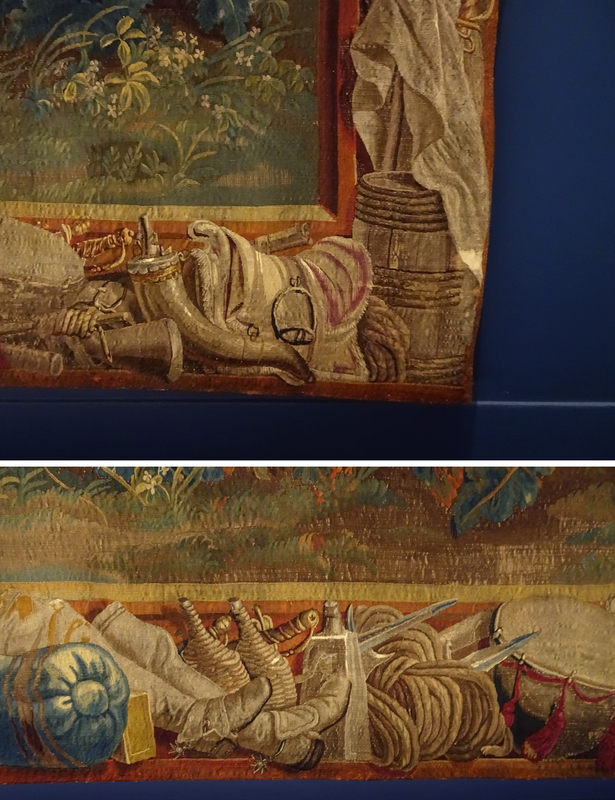 In the Brussels tapestry above, we can see the transmutation of the Netherlandish enthusiasm for trophy frames into a woven border, suitable for an allegorical series on war; but also in that transmutation, the weapons and other accessories of a soldier’s life become even more realistic than in their carved and gilded form. They also encompass very humble things, which are perhaps (perversely) more recognizable for what they are when reproduced as flat pieces of colour, than as three-dimensional carved objects; so here there is an upholstered saddle, a sleeping bag, and basketwork flasks (probably for powder). This aspect of the tapestry trophy frame also means that the items in the trophies are less a commentary upon the pictorial scene they enclose (as in a conventional frame), and more a part themselves of the scene, as though they were the apparatus and detritus of the soldiers in the image, left in the foreground whilst the action shown takes place in the middle ground, and soon some more of the company will load them up into the wagons in the rear of the march. 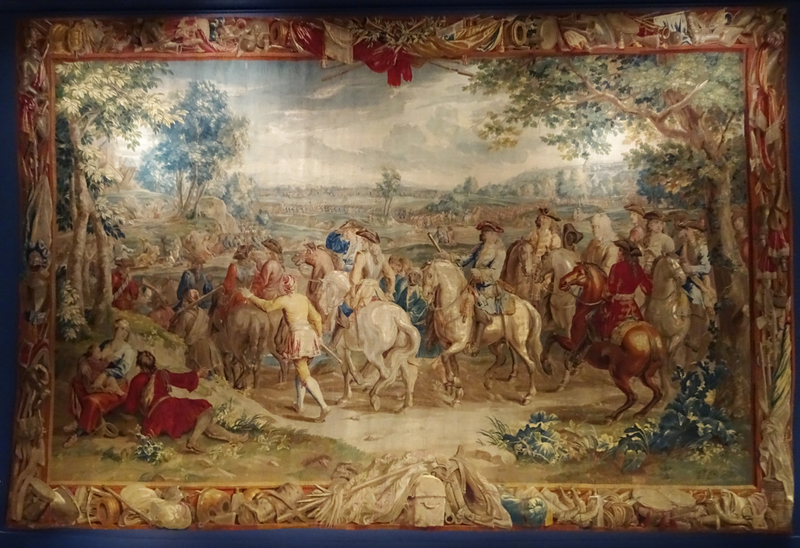 The French Bérainesque tapestries, two of which hang round the corner from the Belgian one, above, are completely different. They do not depict realistic scenes, with landscapes and sky (although they depict realistic figures and animals), and yet the woven frames which enclose them are more realistically ‘picture frames’ than the border of soldiers’ possessions in The march. These are woven architectural ‘carved’ frames, with the ornaments of wooden mouldings: a hollow or scotia, with flutes & fleurons, and an astragal with beads. The scotia has even been coloured to shade it into concavity. 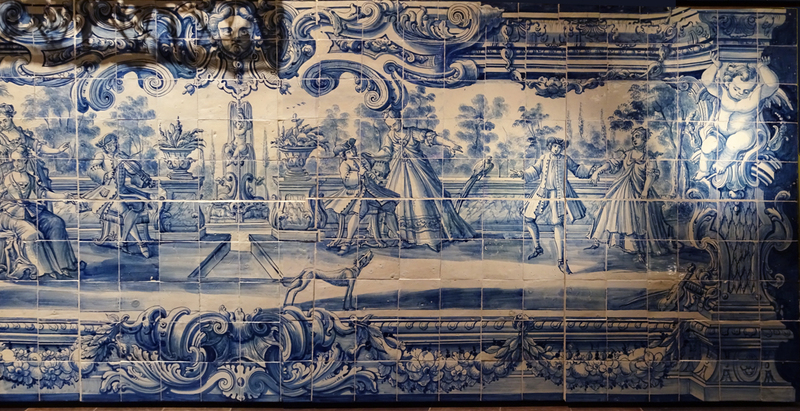 Frames can also be imitated in ceramics, and there is a beautiful secular example in the Baroque galleries of a genre dealt with, mainly in the religious sphere, in Frame simulations in 18th century Portuguese azulejos. This is not the avant-garde Baroque of contemporary Paris, which was by this time the lightness of the Rococo rather than the massive architectural ornament of the 17th century, but it marries beautifully with the balustrades and fountains of the terrace where this very Rococo fête champêtre takes place. 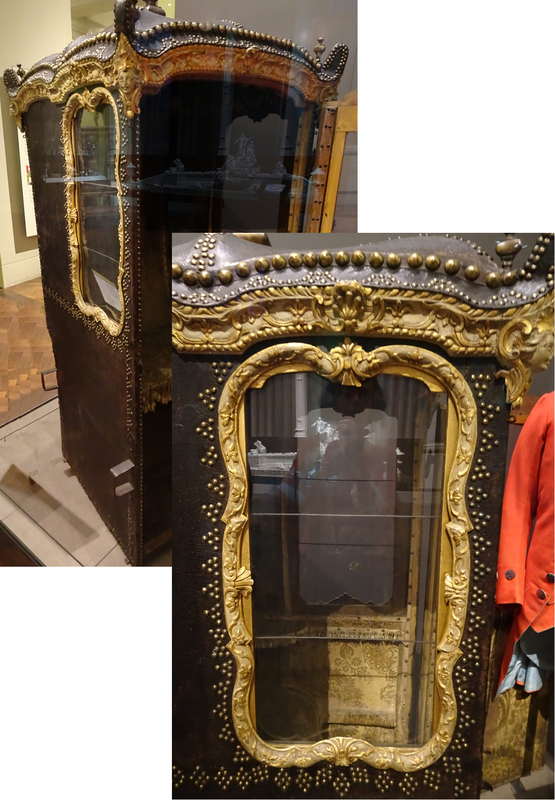 True Rococo style is mirrored in the wooden frames discussed in the article (above), and in objects such as the Genoese looking-glass, 1735-40, also on display in the galleries. 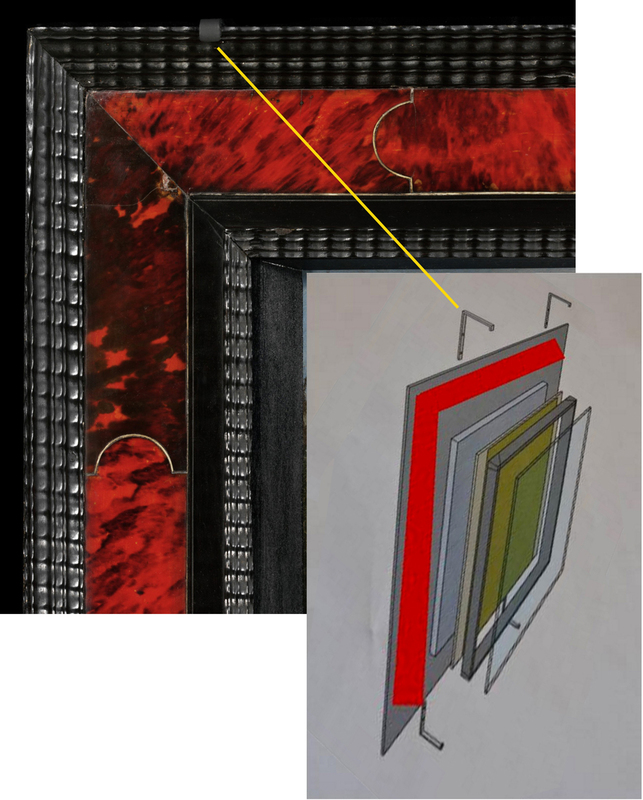 However, to continue with this demonstration of the diversity of frames, framing connections and framing materials, here, instead of another flamboyant looking-glass, is a humble frame with a very different use and location. It is the window of a sedan chair, probably from Piedmont, which uses simplified ornament (of a Bérainesque or Marot-ish sort) on a frame which is asymmetrical about the vertical axis, and which employs the serpentine line of the S-scroll as a very simple ‘architectural’ border within what is effectively a miniature Rococo edifice. Here, there is no sense in which the frame unites the various applied arts within an interior with the architectural frame which contains them (as with a looking glass, tapestry, or cabinet). The sedan chair is the taxi of the 17th and 18th centuries; it is also therefore an index of the extent to which a fashion moves outside, away even from the façade of a building, and into a wider and more stylistically diffuse world. At the same time, it must agree with the style of those who travel in it; like a coach, it must be contemporary, not out-dated, but an advertisement for the taste of those who travel in it. And because those within look out, the windows they look through should present them, framed by a moulding which echoes their costumes, like fashionable portraits. 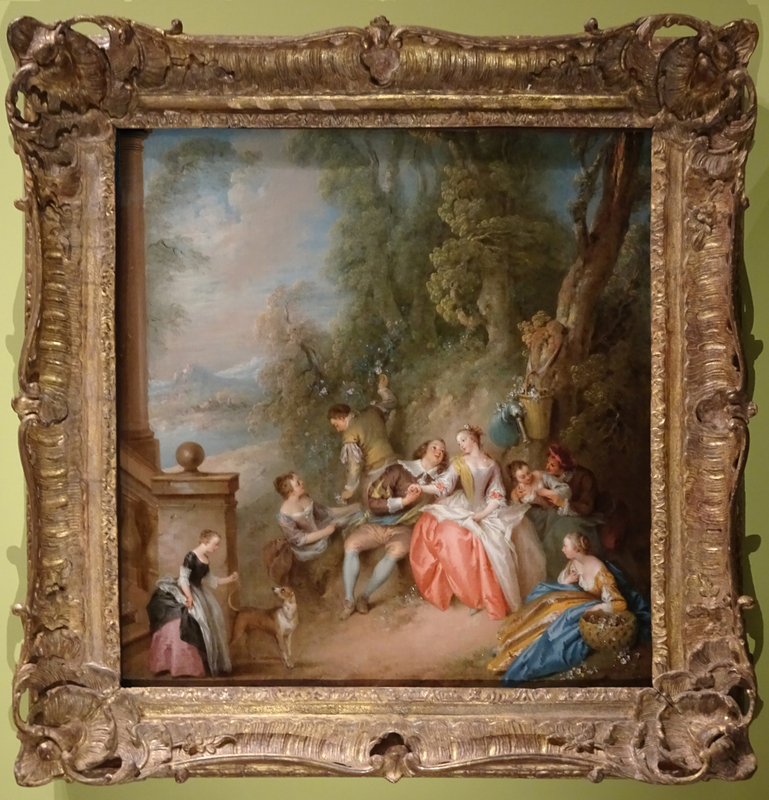 The full-stop, as it were, to this brief survey of disparate frames, is not itself a frame, but is part of a set of boiseries, probably from a Parisian hôtel particulier, and possibly designed or made by a member of the Bâtiments du roi – the King’s workshops. 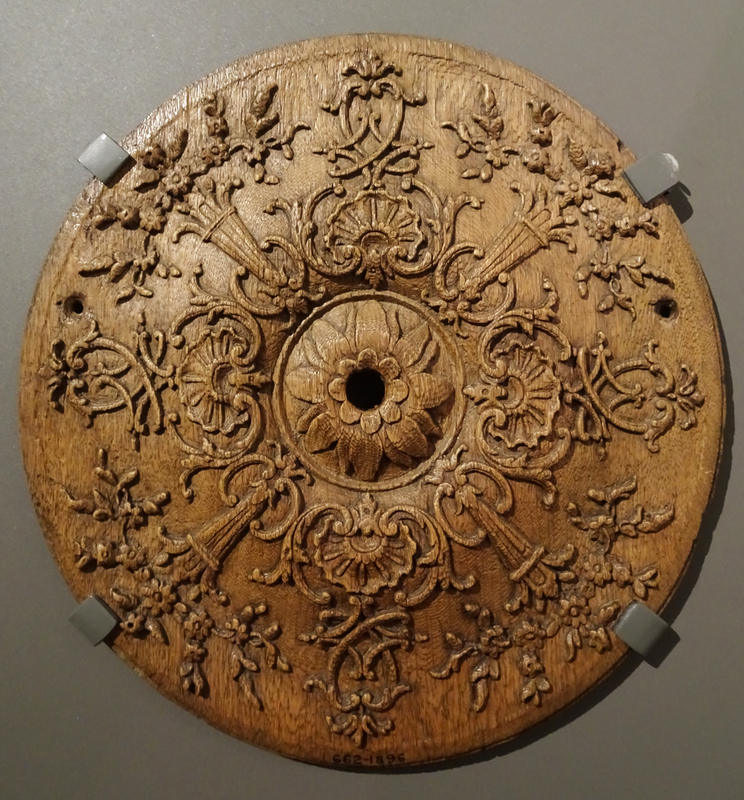 Although it may seem a humble fragment of a grand interior, it is composed as carefully as any frame, with the ornament – which would again be of a piece with the interior – carefully designed to sit around the petalled sunflower at the centre. This is the same wood out of which many contemporary frames were carved, and it shows the fineness of detail which was produced, even before the finish – which might be as simple as waxing, or as complex as gessoing & gilding or painting. This is the raw stuff of 18th century French frames, and it demonstrates – as do so many of the other items in these galleries – the skill of the craftsman and the skill of the designer.